Altitude hold: with the built-in air-press height-set module, the aircraft will fly at a certain height steady and quiet. ✻Function - Sideward flight, turn left/right, up/down, forward/backward, altitude hold, one key take off/landing, 3D flip, WiFi FPV, headless mode, one key return, foldable, waypoint fly. ✻Brushless Motor - Silence, lower consumption, strong power to the quadcopter With automatic return function, the copter will automatic returning and landing when lost connection or signal received interference. ✻With 480P HD Camera - Can capture and record every beautiful and unforgettable moment. 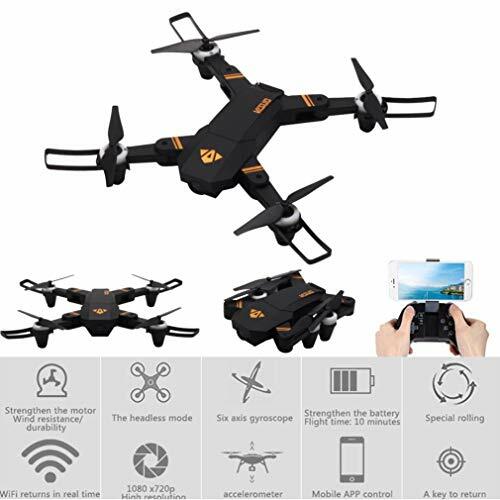 ✻Package Content - 1 x XS809mini Drone 1 x Remote Controller 1 x 7.4V 580mAh Lipo Battery 4 x Propeller Protector 4 x Spare Propeller 1 x USB charger 1 x Sticker set.